In August 2016, the ability to host files on Google Drive is being deprecated. Many add-ons and sites rely on this capability (this one included) and will need to get on with finding somewhere else to host their files and images. One option is Google Cloud Storage. The downside is that you may have to pay something for it. It's cheap, but it's still something. For the purposes of this post, I'm assuming you have a domain you can use. First step is to verify that you own the domain. There are a number of ways to do this, but let's use the one where you verify your domain ownership by adding a TXT record to the DNS record through your domain provider. This varies by provider, but here's how to do it with namecheap. Go to Google Webmaster Central, and create a new property. You'll get something that looks like this to create a TXT record with. create a TXT record using that code in your dns management dashboard, that points to the domain you want this to refer to. 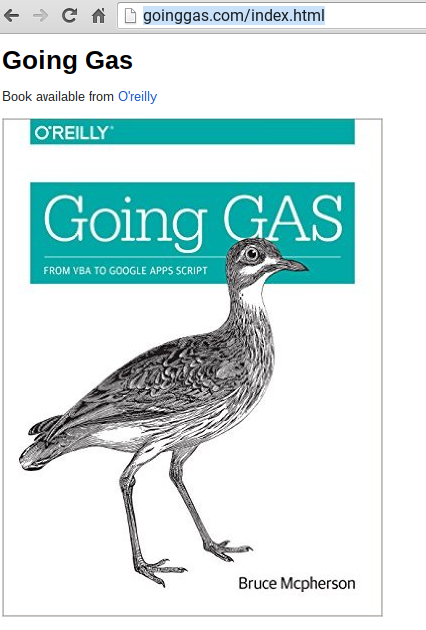 I've pointed this to the naked domain - goinggas.com. This is how it looks on NameCheap's dashboard. If all that goes well, Google will confirm that it believes you own that domain. Next up, you need to create a CName record. The same procedure as for the TXT record verfication. This is an alias that DNS uses to direct traffic to. In the Namecheap dashboard above, I've pointed the naked domain at c.storage.googleapis.com. Now you need to go to the Google Developer console and either create a project or use an existing one. This project is going to hold your cloud storage for your domain. You'll need to enable billing - this is where you need to look at the rates and figure out how much, if anything, this is going to cost you. Now you can start to upload stuff to the storage bucket. There is a command line tool to do this with, but you can also use the tools in the console. Don't forget to click the public link checkbox to make it visible. That's it. It will now serve up your files. Here's mine.